Not so long ago, the world felt like a smaller place, and everybody knew everybody else in their neighborhood. Now, many of us aren’t familiar with our neighbors, and only speak to them in passing. 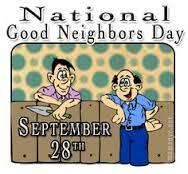 Why not use Good Neighbor Day as an opportunity to lend a proverbial cup of sugar, and get to know the people who live nearby? Many people around the world observe World Rabies Day (WRD), which raises awareness about the impact of rabies and how the disease can be prevented. It is held on September 28 each year. is an annual event on April 7 to draw attention to particular priorities in global health. Rabies is widely distributed across the globe. More than 55,000 people die of rabies each year. About 95 percent of human deaths occur in Asia and Africa, according to WHO. Most human deaths follow a bite from an infected dog. About 30 to 60 percent of dog bite victims are children under the age of 15. There are safe and effective vaccines available for people who have been bitten by an animal that might have the disease, but usage in developing countries is low due to the high cost.